SWING INTO SPRING SALE: Your Choice - (2 Year Warranty + SAVE $1,450) or (SAVE $1,750)! Ends April 30, 2019. 2019 Ski-Doo Renegade® Enduro™ Rotax® 850 E-Tec® Black DISCOVER MORE Geared for the adventure rider who wants to find new trails, or make their own tracks, the 2019 Ski-Doo Renegade Enduro - now in the REV Gen4 platform - provides the ultimate riding experience for the pure explorer, with advanced crossover features. 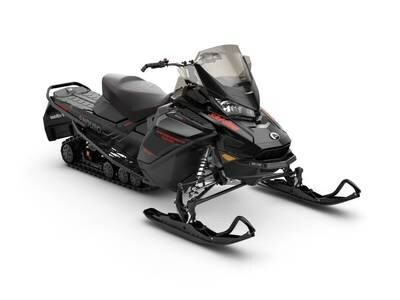 Features may include: E-TEC ENGINES LIGHTWEIGHT POWER WITH EFFICIENCY E-TEC engines are the most popular 2-strokes in snowmobiling thanks to their incredible power and unmatched dynamic response with exclusive E-TEC direct-injection technology. These lightweight twins are built on principles of square (equal bore and stroke) design, and a nearly perfectly balanced narrow geometry. Plasma-coated, mono-block cylinders are used for exceptional durability, while the precision of E-TEC injection means you get excellent fuel and oil economy, plus virtually no 2-stroke smoke and smell. And preparing for the off-season is easy with built-in automatic summerization function. REV Gen4 PLATFORM NEXT GENERATION OF A LEGEND The 4th generation of the REV platform is designed around aggressive trail riders with a narrow, compact package giving the rider more freedom to move and influence the sled. More centralized masses (especially side-to-side), light weight and industry-leading suspensions make the vehicle ultra responsive. AIR RIDE REAR SHOCK RIDING ON AIR Air Ride delivers another level of control and plushness. You tailor the ride for trail conditions or load – on the fly – with just a flick of the handlebar rocker switch, which adjusts the rear air spring to one of five preload settings. RMOTION REAR SUSPENSION CAPABILITY, CONTROL AND COMFORT Provides more capability, more comfort and more adjustability. Separate spring and shock dynamics combine with the most rising-rate/progressive motion ratio in the industry to give the rMotion suspension a supple ride in small bumps with added capability in large ones. And there’s no need to be a suspension guru to enjoy the ride – with its broad sweet spot, you can set it up once and it will perform impressively in nearly every condition. ENDURO HEATED SEAT HEAT AND COMFORT WHERE YOU NEED IT MOST. Bitter morning rides are a thing of the past with two selectable heat settings in the plush trail seat. Narrow at the front for easier rider movement during aggressive rides. Wide and flat at the back for improved comfort over the long hauls. 1.85 gal (7 L) rear storage. PILOT TS ADJUSTABLE SKIS DIAL-IN HANDLING The industry's first adjustable ski. Dial-in ski bite for any snow conditions or your riding style by turning a knob on the ski leg, which raises or lowers the ski runner over a range of .5 in. (12.5 mm). This blade runner and new square keel design work together to make darting a thing of the past.